With 64.71% of ballots of precinct election commissions counted, Ruslan Badayev holds the lead in the repeat parliamentary elections in Ukraine at constituency No. 94, Mykola Kruhlov at constituency No. 132, Mykhailo Poplavsky at constituency No. 194, Leonid Datsenko (Batkivschyna) at constituency No. 197, and Viktor Pylypyshyn at constituency No. 223. According to the figures published on the Web site of the Central Election Commission, with 43.7% of ballots counted at constituency No. 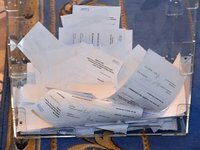 94, 60.12% of voters supported Kyiv Regional Council deputy and Deputy Director of OJSC Hadiachsyr Badayev, and 20.32% voted for Radical Party representative Andriy Lozovy. With 78.26% of ballots counted at constituency No. 132, 46.87% backed Mykolaiv Regional Governor Kruhlov, whereas 46.74% voted for an opposition candidate, the leader of the Seliansky Front public organization, Arkadiy Kornatsky. With 89.15% of ballots counted at constituency No. 194, Rector of Kyiv National University of Culture Poplavsky leads in the repeat elections with 53.39% of the vote, whereas his opponent from the opposition, Mykola Bulatetsky, collected 36.03%. With 57.53% of ballots counted at constituency No. 197, the chief editor of the Nova Molod Cherkaschyny newspaper, Datsenko, holds the lead with 61.51% of the vote, whereas the leader of the Union of Afghan War Veterans, Serhiy Chervonopysky, garnered 25.66% of the vote. With 58.41% of ballots counted at constituency No. 223, the head of the Residents of Kyiv Above All organization, Pylypyshyn, continues to hold the lead with 44.98% of the vote, whereas his opponent, Svoboda deputy Levchenko, collected 40.69%.